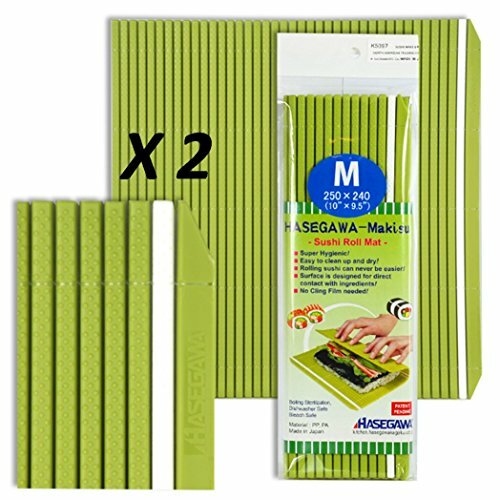 Set of 2 SUSHI MAT (Professional grade) Super hygienic Easy to clean up and dry Rolling sushi can never be easier Surface is designed for direct contact with ingredients No cling film needed Mesurements: 10" x 9.5" (250 cm x 240 cm) Material: Plastic Brand: HASEGAWA This non-stick mat prevents rice from sticking when rolling "Uramaki" style rolls (when sushi, such as California Roll, is rolled with the rice on the outside). Also you can use for roll cake. This listing is for 2 pieces Sushi Mat. If you have any questions about this product by Hasegawa, contact us by completing and submitting the form below. If you are looking for a specif part number, please include it with your message.